There are many new windfarms about to begin operation in Scotland. If you live in South Ayrshire within 12km of Dersalloch wind farm Windfarm Noise Alert Dersalloch and keeping a Diary or Assel Valley wind farm Windfarm Noise Alert Assel Valley and keeping a Diary you might notice changes to your health when these windfarms become operational in the near future. 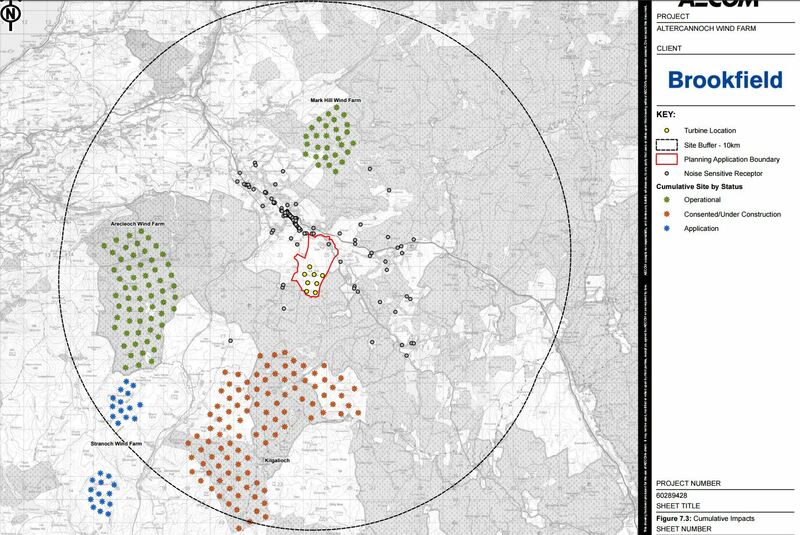 If you live close to Arecleoch and Markhill ( Windfarm Noise Alert and keeping a Diary )you will be aware that they are NOT operational this summer whilst the new 96 turbine development at Kilgallioch is connected to the grid. You may have experienced some of the symptoms when Arecleoch and Markhill were operational. You may have noticed that these symptoms have now disappeared since the turbines were switched off on 6th June 2016. 184 turbines will be switched on soon. 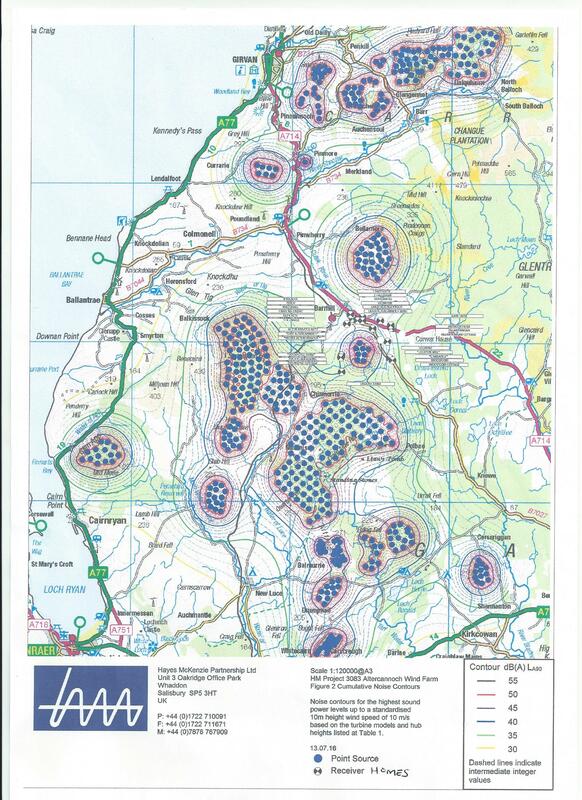 This map (taken from the public domain for the current Altercannoch Windfarm planning application) shows the impact of Cumulative Noise Contours on Barrhill and surrounding communities and this map shows the impact on the larger area including Girvan. Are-Hunterston-turbines-making-people-sick in Fairlie North Ayrshire? This Open Letter to the members of the panel developing the WHO Environmental Noise Guidelines for the European Region has gone to the WHO on your behalf. Information recorded in your journal has a few important uses for yourself and others. Your local health practitioners– you can use it to demonstrate a correlation between symptoms and noise exposure if there is one. If you are sleep deprived, your memory can be affected, which makes it all the more important that symptoms and problems are documented accurately. Acousticians– who can use it to investigate if any of the acoustic measurements are directly correlating with the times when you are experiencing and reporting symptoms characteristic of noise exposure. A useful example is the detailed instructions which Steven Cooper gave to the residents at Cape Bridgewater in the recent acoustic survey commissioned by Pacific Hydro at their Cape Bridgewater Wind Development, to investigate longstanding complaints of sleep disturbance and other adverse health effects from some local residents. The instructions and one of the resident’s handwritten templates can be downloaded at the end of this webpage. Lawyers– accurate and thorough documentation of symptoms with or without acoustic exposures may prove of assistance if there is subsequent litigation. It is very important to document what happens when you are not noise exposed, as well as when you are, so the comparison can be clearly seen. How do I keep a journal? Exercise book– find an exercise book or something similar. Whatever it is, make sure you use this book only for recording your health data. That way everything is in the one place and it won’t be confused with other information. Computer spreadsheet– use a program like Microsoft Excel (or similar) and record your symptoms electronically. If you use this method, we recommend printing the spreadsheet or backing up the file every so often. Very importantly, it is best to do record your symptoms at the time you are experiencing them. Visual (Linear) analogue are a simple easy way to visually record what the sleep over the preceding night was like. Information about methods of assessing fatigue is available from Dr Millar’s presentation. Recurrent assessment of sleep in this fashion can form part of a sleep diary, which is useful for residents and their health practitioners to view in order to better understand and quantify the severity of the sleep impact. What does a Personal Health Journal Look Like?